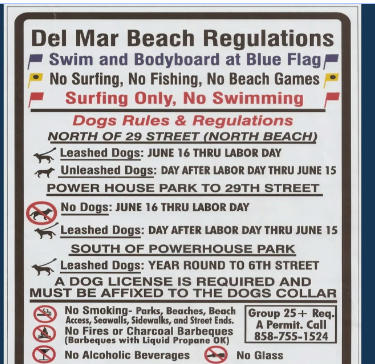 DEL MAR — Council members took another “paws”-itive step forward in expanding off-leash dog hours at city beaches, approving the introduction of an ordinance at the Aug. 6 meeting with a 4-0 vote, with Ellie Haviland absent. But owners can’t let their canines run untethered for another few months. The modified rules won’t take effect until Oct. 4, after the final adoption slated for Sept. 4 and a 30-day wait period for education and outreach. The adjusted law is making minimal changes. Dogs will be allowed to run off leash from dawn until 8 a.m. from 29th Street north to the Solana Beach border year-round and between 25th and 29th streets during the off season, from the day after Labor Day through June 15. On the enforcement side, there will be a requirement for owners to exchange information after a bite whether the animal is leashed or not. The new rules also allow enforcement penalties for violations. Resident Eunjee Viscardi, who in the past said she was attacked by dogs and verbally assaulted by some owners, was the only person who opposed the changes. Viscardi, who said the way the issue was handled made her “look like a villain,” also said the new rules are too vague. She suggested using a specific start time, such as 6 a.m.
Councilman Dave Druker said signage must be simple and easy to read. He also has concerns about compliance. “Right now, the people are treating the beach as being leash-free, period,” he said. “This is a huge enforcement issue. Us changing this isn’t going to change the enforcement of this. Councilman Terry Sinnott said city officials should re-evaluate the program in a year. “If this isn’t done well by the city and the dog owners they may, in a year’s time, lose the privilege totally,” he said. Dog owners initially asked to expand off-leash dog hours in other areas but council declined to do so because it would have required a permit from the California Coastal Commission. Until the new law takes effect in October, the following existing rules remain in place. Dogs must be leashed June 16 through Labor Day. Unleashed dogs can run under voice-control between the day after Labor Day through June 15. No dogs are allowed June 16 through Labor Day. Leashed canines are allowed the day after Labor Day through June 15. Dogs must be leashed year-round. The vote was 4-0 (not 4-1), with Councilmember Ellie Haviland absent.